And the latest news from Burgess is of a hefty $2 million cut in the price of the 45.03m motor yacht Big D.
Built by Hitachi in 1986, a major refit in 2008 saw her ABS classed and MCA compliant. A thoroughly proven world cruiser with an exceptional range of 7,300 nautical miles, Big D has the volume of a 50m+ yacht with spacious, light-filled interiors styled by Pierre Tanter and Studio Larvor and refurbished in 2008. Big D has been well-maintained with upgrades and the installation of new equipment, furnishings, tenders and toys made periodically throughout her current ownership to keep the yacht up to date. 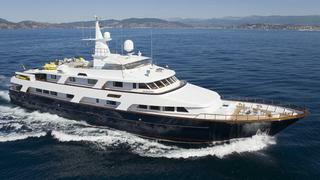 At anchor off the Monaco Yacht Show, Big D is now asking $7.9 million.